Carowinds is right at the heart of where the Carolinas come together. With over 60 rides, shows and attractions, they have everything you need to make lifelong memories. 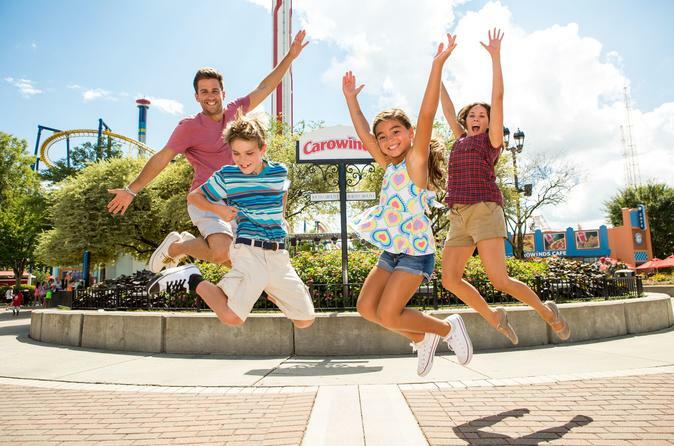 Carowinds is fun for the entire family! Buy your Carowinds ticket ahead of time to skip some of the waiting in line and get right to the fun! From some of the most thrilling roller coasters in the world to the all-new Camp Snoopy kids area and the regions premier water park, there’s fun for everyone at Carowinds! Grab a friend and scream out loud on spine-tingling thrill rides or experience one of 13 world-class roller coasters. Do you dare to ride Fury 325, the worlds tallest and fastest giga coaster; or speed through over 5,000 feet of track on Intimidator. Or ride Vortex, the first stand-up coaster in the South! So many rides to choose from. For the younger guests, get ready for an exciting new adventure in the all-new Camp Snoopy! This exciting transformation of the kids’ area will be packed with more thrills, more giggles and more fun than ever before with the addition of six new junior attractions, new amenities and a re-imagined PEANUTS theme with all your favorite characters. But the fun doesn't stop there! Get completely soaked – again and again – at Carolina Harbor, the all-inclusive waterpark that is included with your admission ticket (open seasonally). This massive waterpark features everything from giant water slides and wave pools to large play structures and a three-acre kids’ area. From mild to wild, Carolina Harbor is the coolest place to slide, splash, chill and dine. Carowinds also hosts a full line-up of entertainment including gravity defying acrobats, roaming acts and dancing-in-the-streets! Your memories are waiting. Start your Carowinds adventure today! Special Offer - Price displayed includes a 24% discount off the local admission price! Book ahead and save! - Book Now!